The 75th Annual Golden Globe Awards, held on January 7 at The Beverly Hilton, brought out the stars. Each celebrating and each sharing a united message! With the HFPA on hand their message was heard in Hollywood style. And style is what we have to share with our readers. Below are looks for some of the most stunning women of Hollywood. So flip through our slideshow to Get The Look for Caitriona Balfe, Dove Cameron, Jessica Biel, Margot Robbie, Saoirse Ronan, and Susan Kelechi. The other star of the evening was the ghd Gold 18k Styler! The new gold standard is here, and has officially made its dazzling 18K red carpet debut at the 75th Annual Golden Globes. 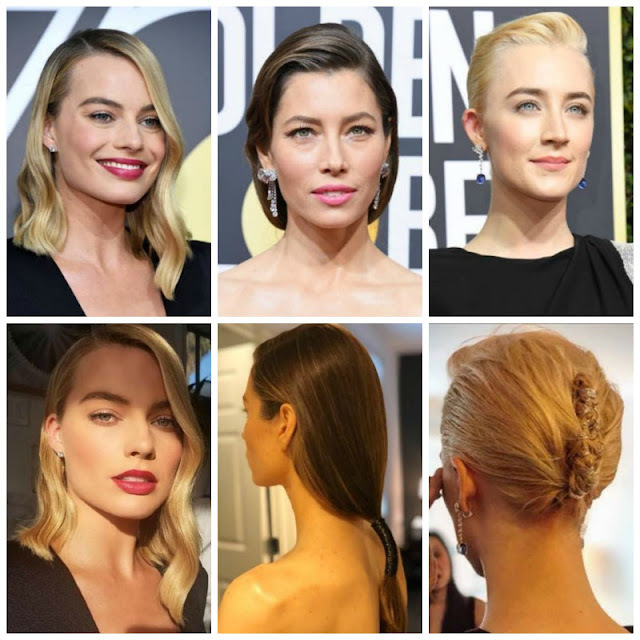 To celebrate ghd’s best-selling gold styler having a sleek new makeover and technical upgrade, celebrity stylists Adir Abergel and Bryce Scarlett both used a very special version to create Margot Robbie, Saoirse Ronan and Jessica Biel’s award-winning looks. With only six available in the country, this ultra-luxe version can’t be bought. Good news: the consumer-friendly version is coming... details below! Celebrity Stylist Bryce Scarlett used the ghd Gold 18k Styler to give Margot soft, elongated waves with a contemporary edge. “What I love most about ghd’s new Gold 18k Styler is the sleek design and curved edges allow you to bend into the hair so smooth and seamlessly that you can easily create any shape you want without any creasing or snagging,” says Bryce. Angling the styler vertically, he wrapped one-inch pieces around it all going in the same direction to create a uniform look, going over the ends for a modern finish. “What makes Margot’s hair look so modern tonight is the sharpened ends and the new ghd Gold 18k Styler was key for getting that extra-sharp, almost pointed, finish that made all the difference here,” Bryce says. Celebrity Stylist Adir Abergel used the ghd Gold 18k Styler to give a silky-smooth finish to Jessica Biel’s low pony for a look that felt classic, with a modern twist. 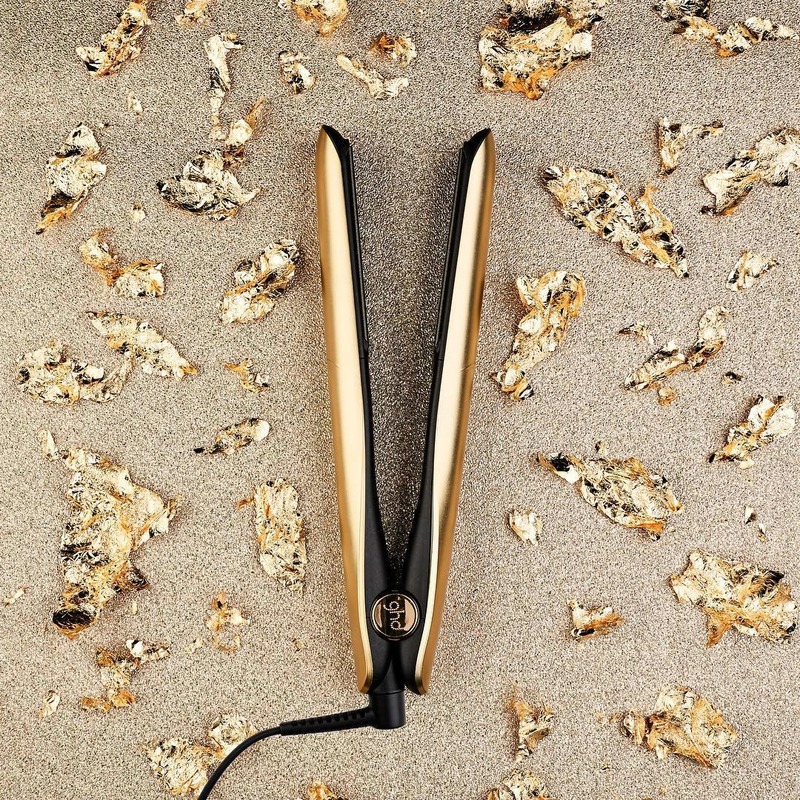 “I used the new ghd Gold 18k Styler to smooth out the cuticle and lock in the shiny texture,” says Adir. “It glides through the hair like no other iron I have ever tried before and distributes the perfect amount of heat to hair to set a style." For Saoirse Ronan, on the other hand, it was all about mixing masculine structure and feminine texture, so Adir used the ghd 18k Gold Styler to add shape to the hair that gave the updo more volume and texture throughout. “This tool provides incredible versatility with your styles and textures whether you want to go straight or wavy—and no matter what look you choose, the results will be super shiny,” says Adir. The ghd Gold Styler is launching in February and will be available at ghdhair.com/us for $199.